A horse stable owner opens the door of her tack room to let in the fresh Spring air. With a class of youngsters coming this afternoon, she needs to clean and polish the saddles and bridles. 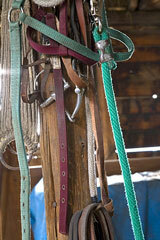 She will teach her students how to care for the tack after their riding lessons. They are eager learners who will benefit from the instruction throughout their horseback riding years. Use the search box on this page to find information about equestrian products and related topics.